The capitular hall – or chapter room – has a Roman facade, consisting of a semi-circular arched doorway framed by two gemel windows. The capitals are furnished with simple ornaments representing feuilles de cistel (reeds), the emblem of the Cistercian order. 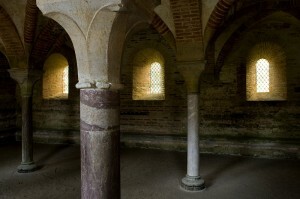 The interior, which dates from the end of the 12th century, consists of two bays with cross-ribbed vaulted ceilings. The vaulting is laid out in bricks. They consist of quadripartite toric rib brickwork. They fall, in the centre of the room, on four marble columns topped with capitals exploiting the water leaves already present on the capitals on the front facade. A stone bench is running along the walls of the room. The columns in the abbey chapter house are made in Campan marble extracted from a quarry near Bagnères-de-Bigorre and used since Roman times. Two of the columns in the chapter room are in so-called “Isabelle” marble whose background colour is soft pink. Two others are made of “Red Campan”: deep red background with even darker veins. 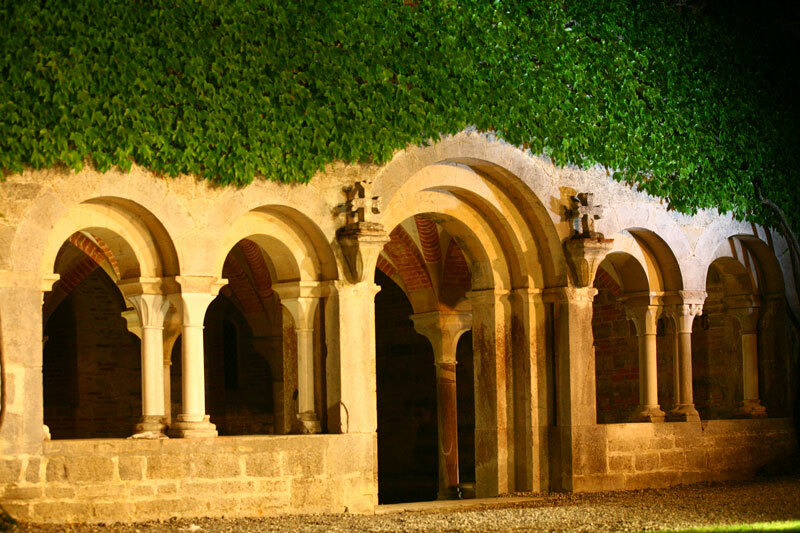 These subtleties demonstrate the finesse with which the Cistercians decorated their abbeys while at the same time retaining a certain sobriety.